We get a title drop/dramatic reveal combo right up front this episode, with Barry facing Savitar and declaring, “I know who you are.” Before that reveal can happen for the audience, though, we must flash back to sixteen hours earlier, before Barry figured out the thing that my Twitter timeline already figured out months ago. Listen, guys: Barry Allen? He’s cute and he means well, but he’s not the brightest bulb, you get what I’m saying? I don’t liken him to floppy-eared puppies because floppy-eared puppies are particularly good at deductive reasoning. But before Savitar can be dealt with, Team Flash has to find and stop Caitlin. They don’t know yet that Caitlin’s already teamed up with Savitar, just that Barry’s trip to the future tells them she will, and that it’ll be bad for everyone when it happens. On top of this, the team needs find and recruit Tracy Brand, the future scientist who will give them the device they’ll use to trap Savitar — four years after Iris is killed. Everyone hopes that finding Tracy early and giving her a little assistance on the Savitar-trapping device will help speed things along and allow them to trap Savitar before Iris’s death date. Oh, how happily these two items on Team Flash’s “to-do” list coincide! Finding Tracy Brand is easy enough — she’s a grad student at a local university — and when they do find her, Killer Frost is close behind. 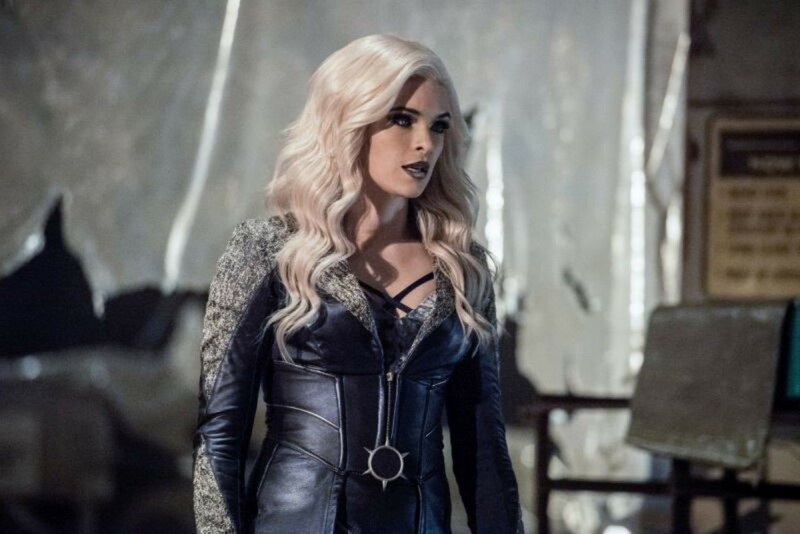 Caitlin seems to have gone pure Killer Frost, even getting a wardrobe change to finalize the transformation. Where does one find a blue pleather villain costume, anyway? Do you think she threatened a tailor into making it for her? Is it made from ice crystals, a la Elsa’s dress in Frozen? The mysteries of comic book TV show life. Hey, it’s more fun to question meaningless stuff like costumes than it is to question the reasons why Caitlin as Killer Frost is evil, which the show as failed to explain for multiple seasons now. Killer Frost tries and fails to kill Tracy, thanks in part to Barry combining a blowtorch flame with a super-fast snap (no idea how that worked, but okay). Importantly for the plot, Cisco is of zero help when they go on the offense against Killer Frost. He hides it well, but Julian gets the security footage from the college and sees that Cisco failed to take a shot at Caitlin when he got an opening. Cisco brushes away the vague accusation. Tracy Brand, while smart enough to discover the Speed Force herself and work toward some world-altering scientific breakthroughs, isn’t very smart when it comes to hiding from metahumans. Team Flash must guard her in secret, since she doesn’t believe that Killer Frost was after her. It’s only when Killer Frost attacks again that Tracy allows the team to protect her. While Killer Frost zips around the city on some neat ice slides (though I question where she gets to the moisture to make all that ice — does she generate it along with the cold, or is Central City just Florida levels of humid?) Cisco, once again, fails to launch his Vibe powers at Killer Frost. This gives her the opportunity to stab Barry in the leg with an icicle and flee, since Tracy has been taken away by H.R. and the rest of the team and Killer Frost isn’t allowed to kill Barry. Back at S.T.A.R. Labs, Barry & co. explain the basics to Tracy: She’ll become an incredibly influential and famous scientist in the future thanks to a device she’s making that will open a breach into the Speed Force and allow them to imprison Savitar. If she doesn’t do this, someone (cue significant looks at Iris, so I don’t know why they were dancing around just naming her) will die. That’s a lot to load a civilian with, so it’s no surprise when Tracy high-tails it out of there. Meanwhile, Julian confronts Cisco on his inability to use his powers on Killer Frost and Carlos Valdes gives an excellent performance as Cisco explains himself through tears. Cisco admits that he can’t handle the idea of hurting Caitlin, because Caitlin is his best friend and he’d rather get hurt himself than risk injuring her. We don’t often get to see the Cisco/Caitlin relationship take center stage, so it’s easy to forget that the two were a team before the show even started. Of course Cisco would be having difficulty with Caitlin’s transformation into Killer Frost and the idea of her being their enemy now, probably more so than anyone else on the team. Then there’s a sub-plot involving Joe West and dealing with his growing relationship with Cecile. At first, this plot just seems like your average “side character has a personal thing going on” storyline, with Cecile blurting out “I love you” to Joe and Joe not knowing how to react. He can’t be fully honest with Cecile because being fully honest with her not only pushes his relationship with Cecile — the one normal, non-stressful area of his life — into all the other madness going on, but also endangers Cecile and changes her entire worldview, which a heavy weight to throw onto a person. But this side story gets tied into the main plot with Killer Frost after Joe breaks up with Cecile to keep her away from the Team Flash weirdness (always a stupid idea) and Killer Frost herself abducts Cecile at icicle point, then tells Joe to hand over Tracy Brand or else Cecile gets iced. In the abandoned warehouse where these things always go down, Cecile is tied to a chair and Team Flash shows up to enact their daring rescue plan. Unfortunately for them, Killer Frost has been reading ahead in the script and has all their lines memorized. I’m not sure how it takes Barry as long as it does to figure out Savitar’s identity. The fact that he knew what they were going to do — not just that Cisco was hanging out in the rafters, but also the exact phrasing of everything Barry said — should have been a huuuuge clue. A fight breaks out, as is usual, and Cisco finally gets the courage to do what needs to be done and throw some of his Vibe powers at Killer Frost. He manages to knock her out long enough to draw some blood, which might be key to getting a cure to her powers, and Cecile is safe. Off-screen, Joe tells his girlfriend about Barry, Wally, all the superhero stuff — on screen, Joe tells her he loves her and finally takes off the wedding ring. Aw! But also, why was he wearing that ring when he didn’t exactly part with his ex-wife on good terms? It made sense when he was a “widower,” but keeping a constant reminder of the woman who ran out on you and your daughter and kept your son from you for years? That’s weird. I was going to do a Scooby Doo joke here, but forget it. Not worth it. It’s Barry. Savitar is Barry. Hey, The Flash — thanks for getting the music of Moana stuck in my head with that episode title! I’m not being sarcastic; I love the music of Moana. Julian questioning why no one’s looking for Caitlin even though he should have witnesses the extensive effort the whole team had put into looking for Caitlin is an example of the show making that poor character an idiot for the sake of exposition. Then again, Julian frequently announces when obvious things are happening, so maybe he’s just not that observant? “If you love her, you should be honest with her. At least that’s what you tell me to do.” I think Joe was the one who told Barry to keep his identity as The Flash secret from Iris, so... nice retconning, show. Unless future Barry lied, none of this time travel nonsense makes sense. Savitar knew where to meet Barry at the end because he "lived it" before, but then future Barry would have already known who Savitar was. He would have also gone to the future and found out from his future self about Tracy, otherwise Savitar wouldn't know that Barry would be there.